Onion seeds are available in local gardening centers, as well as from seed catalogs and several websites. If you order seeds from a catalog or online, make sure you’re ordering a type of onion that is suited for where you live. 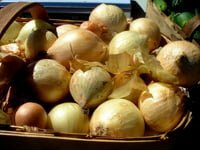 This is the least expensive of the three methods, so if you want to grow a lot of onions, you may want to go this route. Growing onions from seed also gives you the most possibilities in choosing cultivars, as long as you choose onions that will survive in your climate. This method takes the longest and is the most work-intensive. Onions automatically start growing when the spring days reach a certain length, and onions are categorized by their “day length,” or how long the days are when they will start to grow. Onions are either short, intermediate, or long day cultivars; and each region of the country is suitable for only certain types of onions. Short day onions do best in the Southern U.S. (Southern California, Florida). Intermediate day onions do best in the central latitudes (Kentucky, Iowa). Long day onions thrive in more northern latitudes (New England, Washington State, Michigan). If you aren’t sure, your local gardening center or university cooperative extension can tell you. If you’re growing fast-maturing onions, you can sow the seeds directly into your garden 1/4″ deep, as soon as the soil temperature has reached 50° Fahrenheit. Space seeds 1/2″ apart, and space rows 12″ to 18″ apart. Start seeds indoors eight to 10 weeks before the last frost date. Follow these instructions for starting seeds indoors. Once the sprouts have grown tall, trim them down to about 4″ to 6″ high with scissors. Toss the trimmings on your salad or baked potato for some added flavor! Follow the instructions below for transplanting onion seedlings.